At ARC the Musée d'Art moderne de la Ville de Paris is presenting Flux, the first retrospective of the work of David Altmejd. The exhibition includes unshown and older pieces, together with his most recent and certainly most ambitious monumental sculpture, The Flux and The Puddle (2014). The exhibition takes the form of a work in its own right, with creatures sometimes combining the anthropomorphic and the animal: half-vegetal, half-mineral hybrids that make play with the architecture of the museum as they spin out their arachnoid labyrinths. David Altmejd's approach to sculpture is characterized by its wide variety of materials and the artist's longstanding interest in the natural sciences and architecture. 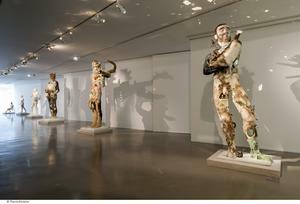 The exhibition reveals a group of deliberately contradictory artistic accomplishments - conceptual and processual, virtuoso and readymade - while the flow of light from countless natural and artificial sources is split by the mirrors, shattered or intact according to the sculptor's whim, that it encounters. This exhibition will travel to MUDAM Luxembourg - Musée d'art moderne Grand-Duc Jean (7 March - 31 May 2015), followed by MACM - Musee d'art contemporain, Montreal (18 June - 13 September 2015). A generously illustrated artist's book of 96 pages will be published by Paris Musées in conjunction with the touring exhibition. It will contain an essay by Louise Déry and a conversation between David Altmejd, and curators François Michaud and Robert Vifian.